The Tong Rana, Kugbilsong Nanlebgtang, the Paramount Chief of the Talensi Traditional area has advised small scale miners to venture into deep shaft mining to protect the environment. 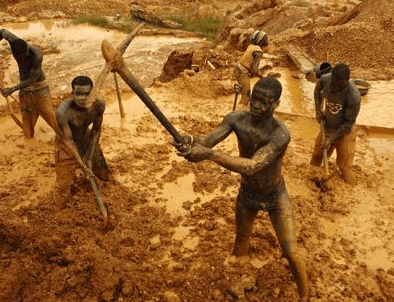 The Paramount Chief, who is also a member of the Council of State asked the small scale mining companies to go into partnerships with each other and seek financial assistance from investors to enable them to undertake large scale deep shaft mining. This, he said, will ensure that mining activities in the area does not pose threats to human life, the environment, including the forest reserves and the water bodies. He said such a measure will help provide employment opportunities for the people in the area, especially the youth. The former Member of Parliament for the Talensi Constituency gave the advice in an interview with the Ghana News Agency, following the recent mining explosion at Gbane, a mining community in the Talensi District of the Upper East Region. About two weeks ago, 16 people, who were said to be small scale miners died through inhalation of toxic gases following an underground mine explosion in a mining pit at the Gbane Community. The Tong Rana, who sympathized with the bereaved families, expressed worry at how small scale mining is inflicting more damage to the environment, and making reclamation more costly with other attendant consequences such as deaths. The Tong Rana explained that, unlike the Yenyeya Mining Enterprise and Pabortaaba Mining Enterprise, two small scale mining companies in the Gbane Community, which have gone into partnership and have been receiving technical support from Shaanxi Mining Ghana Limited, there were quite a number of small scale miners in the area which did not have such partners and were engaging in surface mining and degrading the land and forest reserves. He however, urged those who go around inciting people to be violent to exercise restraints, while the Committee set up by government, through the Ministry of Lands and Natural Resources to investigate the cause of the recent explosion, finds a lasting solution to promote peace and development.